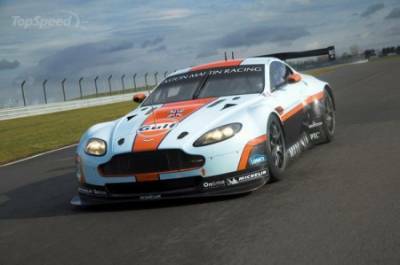 The onset of 2012 would be for the company Aston Martin back in the FIA World Endurance Championship with his new car Vantage GTE. The company intends to participate in the category of GTE Pro. The new car Aston Martin Vantage GTE is based on Vantage GT2 and significantly increased to mind. The model is equipped with the same eight-cylinder V-engine 4.7-liter capacity that can be found, and a production version. Major changes were made cylinder heads, connecting rods, valves and camshafts. A couple of the engine will be a six-speed semi-automatic transmission sekventialnaya. The car body is made of lightweight carbon-fiber and fiber is himself the use of the aerodynamic package consisting of a carbon fiber splitter, diffuser and rear wing. Aston Martin engineers have also equipped the car is new suspension and brakes are Brembo.